When you think of the term ‘visual novel’, I can bet that at least most people think of what is termed as a ‘harem’ visual novel, meaning that the playable character is a man and there are several attractive female characters around him, most (if not all) of which the player is able to make the playable character get romantically involved with at the end. While this is a real treat for guys who like this kind of thing, it leaves us girls who might be interested in this concept out in the cold (unless we like that sort of thing). Luckily for us ladies, there is also something called an otome, or ‘reverse-harem’ visual novel. This type of visual novel is just as it sounds; a story where the playable character is female and there are several attractive male characters around her, several of which you can most-likely hook up with in the end. The first one I ever heard of was Neo-Angelique Abyss, which has no English translation at this time. However, that led me to realize that there must be more than just one otome game out there. So I did some research and found one that was rather highly praised: Yo-Jin-Bo: The Bodyguards. You start off as Sayori, a regular high-school girl. Sayori goes on an archeological dig with her classmates to the ruins of a castle to see if they can dig up anything that could tell them about the castle’s past. In the dirt, Sayori sees a shining pendant and picks it up, forgetting to tell her superior about it and bringing it home accidentally. Later that night, she has a dream of a feudal era princess begging Sayori to help her, and suddenly Sayori is sucked back in time, charged with the task of finding a way to prevent the princess’ death. During your quest you meet a rag-tag group of merceneries named Yozaburo, Jinnosuke, and Tainojo, whose nickname is ‘Bo’. They team up with the princess’ bodyguard Muneshige, a rather questionable priest name Mon-Mon, and an anti-social psychopathic killer (who is, incidentally, my favorite character) named Ittosai to save the princess as they uncover a large conspiracy. The story never got boring to me, and even better is that it the story changes depending on which guy you’re gunning for at the end. The story doesn’t deviate too much on each story path of course, but they are different enough that it won’t get boring playing the game six times to get each guy. It’s also very easy to find a walkthrough for this game online that will outline which choices to make to get what character if you want to be sure that you don’t miss out. And there is quite a bit you can miss out on. In addition to nabbing all 6 guys, there are also ‘bad’ and ‘death’ endings for each path, making a total of 18 possible endings. 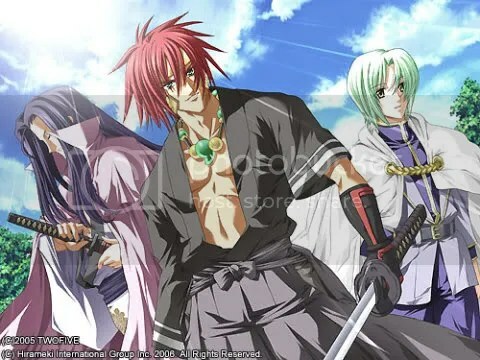 Now while the word yojinbo means ‘bodyguard’ in Japanese, you can see they also used the main characters’ names as a play on the title of the game (The three main guys names are Yo, Jin, and Bo. Get it? HA!). A cheesy move, yes, but it sets the pace for one of the best parts of this game, and that is that this game doesn’t take itself too seriously. At all. This becomes apparent when we are introduced to the characters. First of all, Yo, Jin, and Bo are such good friends that they fight and bicker at every turn, even during heated battles. This adds quite a bit of comedy to the story. The characters also make quite a number of pop culture references on things like Disney, boy bands, and Final Fantasy. They even break the fourth wall when they discuss Mon-Mon’s failing attempts to ensure he is an achievable love interest at the end of the game. I must admit that I was assuming the characters would be much more serious since the few pieces of art I saw before playing showed no signs of there being so much comedy, but I enjoyed the game’s light-hearted moments. Because of the comedic liberties taken with these characters, they aren’t the most deep and interesting people you’ll ever encounter. However, as you play through each of the guys’ paths, you’ll learn more about them and will begin to see attraction brew between your chosen guy and Sayori. The game does a good job of making these interactions believable, and you do find yourself rather attached to the characters by the end of the story. This game plays through like a regular visual novel, clicking through text and having the ability to let the game auto-cycle through the text and to skip quickly through text to the next decision point. Those decision points, however, are where the game begins to get interesting. The decision points are timed, giving you only a brief amount of time to make a decision. I haven’t played too many visual novels so I’m not sure if this is something unique, but I have never heard of or seen something like this in a visual novel before. It adds the tenseness of the situations you’re in, because if you were experiencing what was going on in the game in real life, you’d only have those few brief moments to make a decision anyway. It adds an interesting sense of realism to the game. The game also has more than enough game save slots and a quick-save feature that you can use just by clicking a button. However, in my experience, the quick-save button only saves in the first slot, so if you’re using multiple slots you may want to leave the first slot open for quick-saves. Another thing I like is that although it plays on full-screen by default, you can go into the configuration menu and change it to be windowed, allowing you to play while doing other things. I am always multi-tasking, so this was a big plus for me. You can also adjust the volumes of the background music, sound effects, and character voices to fit your preference. There is also an ‘extras’ menu where you can view collections of the images you’ve seen in the game and enjoy some other goodies as well. Because there is no actual moving animation in visual novels (for the most part), the music and still-frame art are two extremely important elements, and Yo-Jin-Bo does not disappoint. The art is very well done, both with the characters and the backgrounds. The full-body shots of the characters are very limited (about only 2-3 a character) but the close-up faces that are put next to the text box are also done very well and have a variety of expressions. The design of the characters’ clothing and the backgrounds really make you feel like you’re in the feudal era, which works well to balance out the game’s pop culture references and to keep you grounded in the story while still appreciating that humor. Now the sound in this game comes in two parts: the voice acting and the music. The voice acting is absolutely superb. The seiyuu in this game are very well-seasoned and well-known voice actors, many of them coming from big shows like Saint Seiya and Bleach. They voices they use work very well with their respective characters, and are chock-full of emotion. As for the music, it also excels. It has a very feudal era feel to it and is very catchy and addicting. Even though they only have a handful of songs that they use several times, they never get boring and fit the scenes they’re used in perfectly. Yo-Jin-Bo: The Bodyguards is a fun and entertaining visual novel to play. While its story and characters aren’t mind-blowing, the graphics, voice work, and music most certainly are. Couple that with a story that keeps your interest and some good comedy and you have a game that is fun to sit down and play diligently or play casually to relieve some stress at the end of a busy day. If you’re a fan of otome games, this is one title you have to check out.